Giving the gift of Zentangle® is not only a thoughtful idea at any time, you are sharing an endless, life-long rewarding practice with your friends and loved ones. And your co-workers! These are the items I highly recommend for your consideration and I promise your Zentangle gifts will be the most memorable of all. If you could only have one book in your Zentangle library, this is the one. 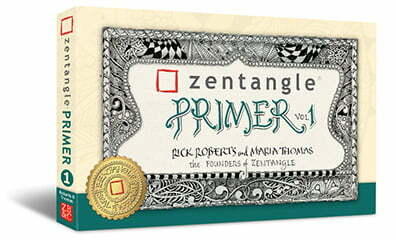 The Zentangle PRIMER Vol 1 is the perfect Zentangle gift. It describes the Zentangle Method™ in detail and offers much much more. Now available in both Hardcover ($49.95 US) and Softcover ($23.95 US) editions. To learn more about the PRIMER and for links to place your order, visit the STORE > ZENTANGLE PRIMER VOL 1 page on the top menu bar. 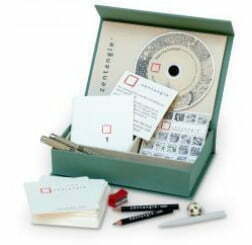 The Official Zentangle Kit makes a wonderful gift that includes an instructional booklet and DVD and all the supplies necessary to get started with this relaxing enjoyable art form. “To understand and appreciate something fully, it’s good to learn the basics as they were developed. We regularly receive emails from people who finally bought a Zentangle Kit, and they inevitably say how much more they discovered there is to the Zentangle Method, how beautiful the Kit is itself, how enjoyable the DVD is, and how much more pleasure they now receive from creating Zentangle art. To learn more about the Kit and for links to place your order, visit the STORE > OFFICIAL ZENTANGLE KIT page on the top menu bar. A perfect gift for your friends and family who are enjoying the magic of the Zentangle Method™. 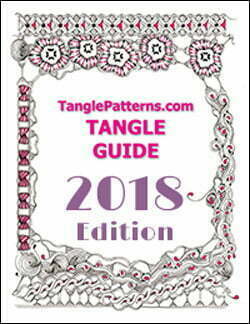 The current Edition of the TanglePatterns.com TANGLE GUIDE is an instant-download 60-page digital eBook (PDF) containing all the tangles on the site from May 2010 through December 31, 2017. With over 1,000 tangles, it’s a fantastic tool for using the site. For more details about the TanglePatterns.com TANGLE GUIDE visit the BOOK REVIEWS tab on the top menu bar. Note: if you are giving the gift to yourself (it is a thing! ), please place your order on this page so you can download your gift instantly: STORE > EBOOKS. It’s a win-win-win — you give a gift without leaving your house, your gift recipient receives a useful tool they’ll refer to again and again, and your purchase helps me keep TanglePatterns going. Beat the holiday rush and order today! Here are the direct links to the ordering pages. Thanks for your time, and many thanks for supporting TanglePatterns with your gift purchases.